Saturday- We had a quiet lazy day. We got up late, watched the Today show, and generally took it easy. We ate left overs for lunch and dinner. Sunday- We woke up to Roxie being sick. We are not sure why. We cleaned up after her, I went over to the pool, we ate breakfast, updated the budget, paid bills, deposited checks. We stayed home most of the day, although Bob went to the Circle K to pick up the Sunday newspaper. Monday- I went to the pool, then after showers, we left to run errands. Our first stop was at Employee Health for my mask fit and TB test. Unfortunately, two workers had called in sick so they could not take me. I have to go back tomorrow. We left there and stopped at the Chiropractor. We then stopped at Verizon Wireless, as my phone would not download Overdrive from the library. The gal put it on their wireless and it downloaded. We went to Walmart then Jimmy John’s to pick up subs for lunch. We returned home and ate our subs. Bob took our absentee ballots to the Post Office and they are in the mail! We took a nice nap and sat out enjoying the weather. We ate leftovers for dinner. Tonight was the first night that it was cool enough for us to leave the doors and windows open. Every other day and night we have been running the air conditioning. 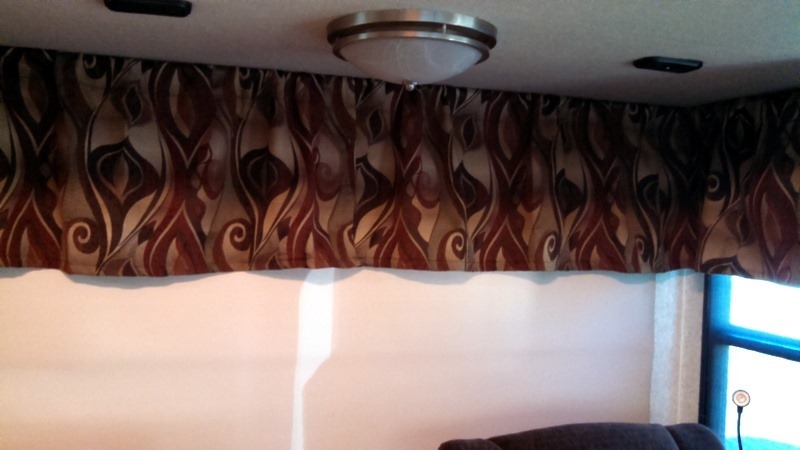 MaryAnne and Ray stopped by for a chat and to see our new valences. We watched TV and went to bed. Tuesday- Bob was out the door early as he had a dental appt. at 8AM. I did laundry the cleaned up the MH. Bob was gone two hours. When he returned he told me he was very impressed. The dentist in Westminster had sent his x-rays, this dentist looked at the tooth, made the adjustments, and took pictures of the tooth. Then sent the pictures to the computer system. Engineer Bob had to go watch the process, and the computer/machine made the crown right then. They took it out of the machine, put it on his tooth and it was a good fit, so they took it back and ‘cured’ it. Then they placed the crown and he was done. Wow, quick and less expensive than any other crown he has had! He still has to return for a filling next week. We went back to Employee Health and I was taken right back. She did my PPD ( the TB test) and then we did the face mask fit. I have to return on Thursday to have the PPD read( I can read them but am not allowed to read my own). I also received a form on Ebola. In my job I should not have any contact with anyone with Ebola, but it was interesting reading. We left and went to Kneaders for lunch. They had opened a Kneaders in Surprise. This is a very bad thing! We love the chocolate croissants at Kneaders. They are the best that we have found in the U.S., second only to the ones we had in Paris. We left and stopped a Bed, Bath and Beyond for a new squeegee for the shower. We continued on to Walmart to pick up some items we had forgotten, then to the library to drop off and pick up books. We returned to the MH and sat out reading our books. Paula and Charlie came home and stopped to invite us over to read the doctors report. We took our chairs and sat out talking to them until about 5:15, when we returned home to cook dinner. Paula is going to need another surgery, then radiation. We turned on the air conditioner during the day, but turned it off in the evening and slept with the windows open. Wednesday- I was up really early and out the door by 6:55 to get to my Physical Therapy appointment at 7:15. I filled out all the paperwork and the gal took me back to do an assessment. My right knee is having this flair, then the left knee is starting to hurt to compensate. Plus this has made my hips out of whack, so everything is a mess! She gave me a few very light exercises for in and out of the pool. I return on Friday. Bob stayed home and did some items around the MH and put up reviews on Yelp. Once I returned home, I iced, per instruction and Bob left to go get gas and to pick up more books at the library. I am to rest the knee, so I stayed home with my leg elevated. We had a quiet afternoon and evening. We ate dinner, watched TV and went to bed. Again, we were able to sleep with the windows open and the roof vents open. We still had to have the air conditioner on during the day. Thursday- I was off early to the pool. Bob cooked dog food. I returned to Employee Health and had my PPD read. From there we stopped at Burger King as Bob wanted a BBQ sandwich. They are no longer doing them and there are not BBQ places in the area. Oh well. We returned home, took naps. and went to dinner with everyone at Haus Murphy in Glendale. We had a great time with Paula, Charlie, MaryAnne, Ray, Pam and Bob and of course my Bob. Friday- I went to the pool, then went to PT at 10:30. Bulls Eye RV repair returned to fix the washer/dryer at 8:00. Bob had them work on the washer/dryer first so that I could take a quick show when I returned. They put the slide covers back on and pulled the W/D back out. We had another huge lint ball, in another location, which they had not found the first time! We made measurements and are trying to figure out what we are going to do. The vent is simply in the wrong place and the lint is pilling up in the bends. The options are to change the lint outlet outside, have an RV repair person come to clean out the lint traps every 6 months, or add a dryer and have a new outlet done. We are not sure what we are going to do yet. PT wore me out, so I returned home, ate lunch and took a nap. We had a quiet afternoon, and ate leftovers for dinner. At 6:30, we walked over to visit with everyone. A new Alfa had arrived, with Kathy and Mike. We had not met them before, but they are now part of the group! They are also Roadrunners.